push their carts along the cobblestones. that will illuminate the coming year. of solitude and no touch from Joseph’s hand. and you were the girl who drove me to my knees. under this slate and copper roof. locked fast within their cellar safe. Lea, I could never let them touch you again. You are safe now, my Precious One. inside the narrow space of this attic bed. Let me swallow you like salvation. like so much water from a cleaning pail. there was nothing beautiful at all. Frank Paino’s first two volumes of poetry were published by Cleveland State University Press. 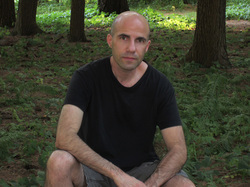 His current work appears in Gettysburg Review and The Comstock Review. Other work is forthcoming in Briar Cliff Review and Catamaran Literary Reader. Frank was the recipient of an Ohio Arts Council 2016 Individual Excellence Award. His poem, “Skeleton Lake,” was selected as the winner of the 2016 Crab Orchard Review Special Feature Award and will be published in the summer of 2017. He is seeking a publisher for his third manuscript while currently at work on his fourth.